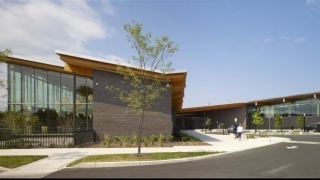 The St. Catharines Kiwanis Aquatics Centre features a double pool design to accommodate the needs of aquatics participants of all ages and abilities. A 7,000 square foot branch of the St. Catharines Public Library is included at this facilitiy. A 25-metre, eight-lane, rectangular pool accommodates lane swimming, recreational swimming and lessons for intermediate to advanced swimmers. An irregular-shaped leisure pool with spray features and water warmed to 90°F accommodates the needs of older adults, children and family recreational activity, therapeutic classes and lessons for children and infants.